A familiar form with an unexpected twist, the Gorman Lamp marries a geometric cone shape with multiple facets and angles. The porcelain lamp's navy finish highlights its ridges and details. Contrasted by its white linen drum shade and matching finial. Finish may vary. The obelisk-shaped glass Elyssa Lamp exudes a unique modern elegance with its striking pattern of impressions and divots. The lamp's smoky finish and ash microfiber drum shade make the it ideal for casual living spaces. At the intersection of artisan and traditional lies the Gabe Lamp. Gabe features an undulating porcelain body, that's accented by two ridges where the lamp's segments intersect. Finished in a vetiver crackle glaze and topped in a natural linen tapered drum shade and matching finial. Finish may vary. 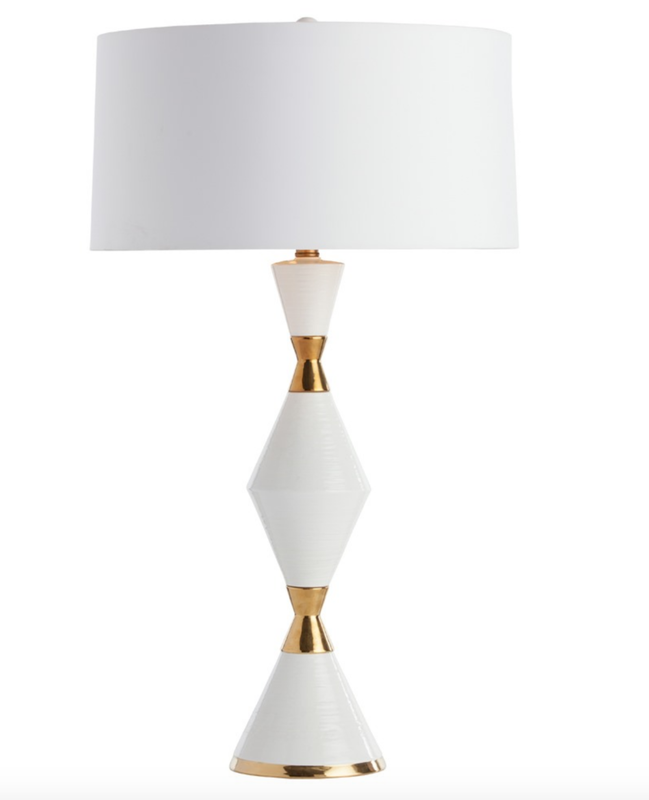 The gold cinch waist detail on this striking white gloss ceramic lamp, makes it an ideal statement piece. The white microfiber drum shade is lined in gold foil to continue the theme and up the glamour quotient. Matching ceramic finial. The subtle vertical stripes lining this soft pastel-colored violet glass lamp create a unique finish that varies piece to piece. The rectangle microfiber shades keeps the frosted lamp symmetric by matching its clear acrylic base. DIMENSIONS:H: 22.5" W: 15" D: 9"
Soft matte glass goes bold with our Fluted Urn Frosted Lamp! The fluted details of the lamp give the urn silhouettes interesting detail. Finished beautifully with a clear round glass base and small orb shaped finial, then topped with a hexagonal hardback white silk shade. Adjustable Table lamp, marble base, silk shade. Jonathan Adler Giraffe Lamp, Porcelain body, wooden base. Double socket adjustable swing arm desk lamp with metal base and body in a nickel finish. 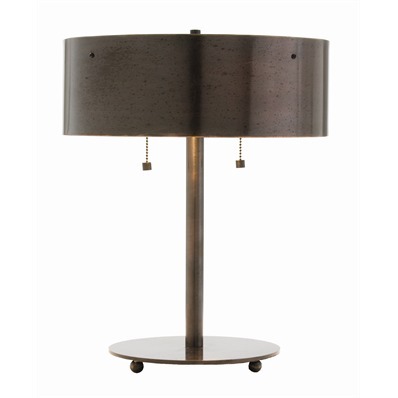 Topped with a gray gunmetal colored drum shade detailed with circular pattern embossing and pewter lining. If you watch The Good Wife you might recognize this lamp, set on an entry table under the firm's sign. The clean lines and double sockets make this antique brass lamp appropriate for night stands, desks, side tables or buffets. One of our best sellers. Double socket snow marble and brass table lamp features a pair of decorative brass pull chains and matching finial. Topped with a putty colored fabric shade with cream cotton lining and rolled edges. English bronze lamp, double socket. Perfect for a desk or night table.